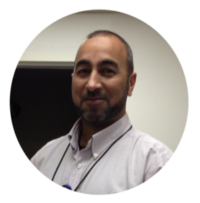 M. Firas (Jessie) Abazid, MS joined the team of Medical Physicists in April 2014. Jessie graduated from Cleveland State University in May 2010 and continued his employment with The University Case Medical Center (UHCMC) in the Physics Department where he gained experience in all facets of Diagnostic Radiology. Mr. Abazid is a Certified Radiation Expert (CRE) for Mammography and Diagnostic Radiology in Ohio. He is also a Licensed Medical Physicist in Diagnostic Radiology in the State of Texas. Illinois as well as the State of Florida (Temp). A member of the American Association of Physicists in Medicine (AAPM) and American College of Radiolohy (ACR), he also holds a Bachelor of Science degree in Electrical and Computer Engineering. Jessie is ABR eligible and will be taking Part 1 of the exam.